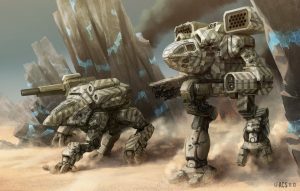 The Maskirovka got its chance in 2462 when the Free Worlds League secured BattleMech technology and blueprints via defecting technicians from a 'Mech factory on the Lyran Commonwealth world of Alarion. The League quickly began their own top-secret project to reverse engineer and produce their own BattleMech designs, unaware that the Maskirovka had succeeded in compromising the integrity of a high level technician on the project. However, the Maskirovka main cell on Xanthe III was taken out by counterinsurgency forces. With an agent of House Marik's Inspectorate hot on their heels, the Maskirovka team working on obtaining the blueprints had to rush their operation which compromised their own security. They succeeded in obtaining the blueprints but had to kill the tech in the process, which in turn led to a lockdown of Xanthe and a vicious hunt for the team. Over a series of incidents, seven of the eight people on the Maskirovka team were killed, as were several members of the Free Worlds League's special forces branch. The sole surviving Capellan deep cover agent managed to bribe his way out of League territory using the final payment, carrying with him incomplete but sufficient details to allow the Capellan Confederation to begin its own 'Mech development program. ↑ 1.0 1.1 1.2 1.3 House Liao (The Capellan Confederation), p. 35 "The Capellan Order - 'Mechs and Rumors of 'Mechs - The Xanthe Operation"
↑ 2.0 2.1 House Marik (The Free Worlds League), p. 16 "The Age of War - Tenure of Geralk Marik"
↑ Handbook: House Liao, p. 19 "History of the Nation - Genesis - The Ares Conventions - The Time of Tribulations"
↑ House Steiner (The Lyran Commonwealth), p. 19 "History - Early Steiner Archons - Lyran Military Superiority"
This page was last edited on 15 April 2019, at 19:27.